Directors Neasa Ní Chianáin and David Rane take us through a year at Headfort, an old boarding school that was once a stately mansion in the idyllic Irish countryside. With old-school desks and school uniforms, the teachers (some of whom attended the school themselves) encourage their students, girls and boys aged 7 to 13, to grow in confidence and self-reliance while exploring arts, sports, and academics in the school’s own distinctive style. That unique style includes having the children work together to build forts in the surrounding woods, encouraging team effort. But dividing them into groups to fight battles is not. Their “school band” is a rock band, and art means collaborative painting on the walls of the music room. Books fill every room, balanced on the mantels of the old fireplaces or stacked on every window sill and surface. There is a sense of playfulness between teachers and students, but students are also expected to work at their chosen interests – no goofing off in class. The students are surprisingly international, with a large number of French and Spanish, as well as other nationalities among the Irish majority. The documentary is mostly fly-on-the-wall, following both students and faculty, with a few interviews. Most often interviews are with dry, ironic, rumpled John Leyden, whose goal for his students is to make them “balanced, independent, thoughtful.” The Leydens are wonderful teachers and share that goal, but they are far from the warm and cuddly movie teacher stereotype. They also are clearly a teaching team – John is more tough love than Amanda, who softens his approach by sharing insights into the children’s background or psychology that John might miss. John teaches music and math, and Amanda teaches English, but the film spotlights them less in class and more in supporting activities – putting together the band or coaching performances for a production of Shakespeare. The school encourages kids to think for themselves but gives rules to promote responsibility and self direction. At times, the school almost feels more like a summer camp than school, with emphasis on fun and social growth as much as classroom learning, but one where adults help the children work through troubles and traumas. 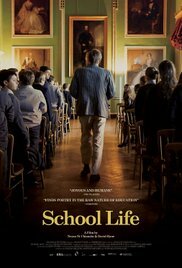 School Life is an enjoyable, charming documentary about a delightfully unique Irish school, and adds a wonderful couple, the Leydens, to the pantheon of memorable teachers on film. EDITOR’S NOTE: School Life is AWFJ’s Movie of the Week (#MOTW) for September 1 – 8, 2017.